Seven months into his tenure, the broad outlines of President Donald Trump's foreign policy are coming into focus. As a candidate, Trump suggested there would be stark foreign policy changes in his administration. But many experts say that on key issues, such as Afghanistan, Syria and North Korea, Trump is continuing along a traditional U.S. foreign policy path similar to his predecessor, former President Barack Obama. Last week, Trump said he changed his mind about pulling troops out of Afghanistan, pledging to boost U.S. forces to help the Afghan government. But he insists his plan is different from previous ones in the 16-year-long war. Trump campaigned with the slogan “America First”, but some experts stress this does not mean America is retreating from the world stage under his leadership. Previous U.S. presidents also embraced using different levers of power, but experts say Trump has broken with precedent by putting less focus on trade, alliances and institutions. Longtime U.S. diplomat Aaron David Miller who is now at the Wilson Center told VOA Trump is traditional in some ways, but calls him a “disrupter” on climate change, building a wall with Mexico and on international trade. Trump has not only advocated a narrower foreign policy, he has embraced a more ambiguous one. His tweets are closely followed as indications of U.S. policy, but experts say they sometimes lead to confusion. Many look to others in Trump's cabinet for reassurance about U.S. strategy. Brian Katulis of the Center for American Progress pointed to the former generals who appear to have gained more influence with the president. Katulis told VOA he is concerned though because he thinks there has been a trend for the last 15 years of a militarization of U.S. foreign policy, a huge increase in the budget to the Defense Department, and a heavy reliance under Presidents Bush, and then Obama, on special forces and drones. That trend appears to be continuing under Trump. Melvin Goodman, who is with Center for International Policy and a former senior CIA analyst, said the U.S. for decades has been leaning more heavily on the military as a foreign policy tool. 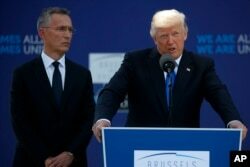 FILE - NATO Secretary General Jens Stoltenberg listens as President Donald Trump speaks during a ceremony to unveil artifacts from the World Trade Center and Berlin Wall for the new NATO headquarters in Brussels, May 25, 2017. The United States is the single biggest military spender in the world, with an estimated military budget greater than the next seven countries combined. At $618.8 billion in 2016, military spending accounted for more than 53 percent of the U.S. federal discretionary budget. The National Priorities Project puts spending on international affairs, which would include the State Department’s budget at $42.8 billion, or 4 percent of the U.S. federal discretionary budget in 2016. The Trump administration has proposed slashing State's budget by almost a third, while boosting defense spending by 10 percent. Some experts pointed to Trump’s foreign policy structure and his relationship with the chief U.S. diplomat, Secretary of State Rex Tillerson, as another departure from previous presidents. Aaron David Miller served as a top adviser to a number of Republican and Democratic Secretaries of State. He told VOA Tillerson’s situation is unprecedented. 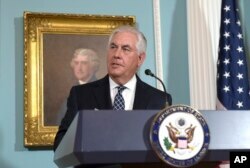 Secretary of State Rex Tillerson responds to a question about North Korea after speaking on the release of the 2016 annual report on International Religious Freedom, Aug. 15, 2017, at the State Department in Washington. The news website Axios reported that tensions over policy differences between Trump and Tillerson have been building, and the two sides are now blaming the other for the lack of senior political appointments at the State Department. Tillerson's spokesman, R.C. Hammond, blamed a "busted" system, according to the Axios report. The website quoted Hammond saying, "The secretary sends over recommendations and they sit on the dock." Trump officials suggested the fault was Tillerson's for moving too slowly, not the White House's. 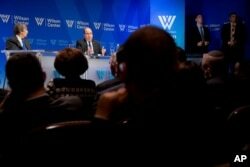 FILE - Wilson Center Vice President for New Initiatives and Distinguished Fellow Aaron David Miller, left, speaks with Israeli Defense Minister Moshe Ya'alon at the Wilson Center, in Washington, March 14, 2016. Miller said the most glaring example of this is that the president has given the high-profile Arab-Israeli issue, not to Tillerson, but to his son-in-law Jared Kushner, who traveled to the region last week. He said every other secretary of state has been the one in charge of the thorny Israeli-Palestinian conflict. Trump and Tillerson have also publicly expressed contradictory views on resolving the Qatar crisis and sanctions on Venezuela. James Carafano disagrees with those who say Tillerson is not empowered. Tillerson raised some eyebrows on Sunday when he was asked by Fox News Sunday’s Chris Wallace if the president represented American values in his response to the racist violence in Charlottesville, Virginia. Tillerson replied: the president "speaks for himself." Some observers have speculated that Tillerson’s days at the State Department may be numbered, a rumor he himself has repeatedly rejected. Melvin Goodman told VOA he would not be surprised if Tillerson is out by the end of the year.